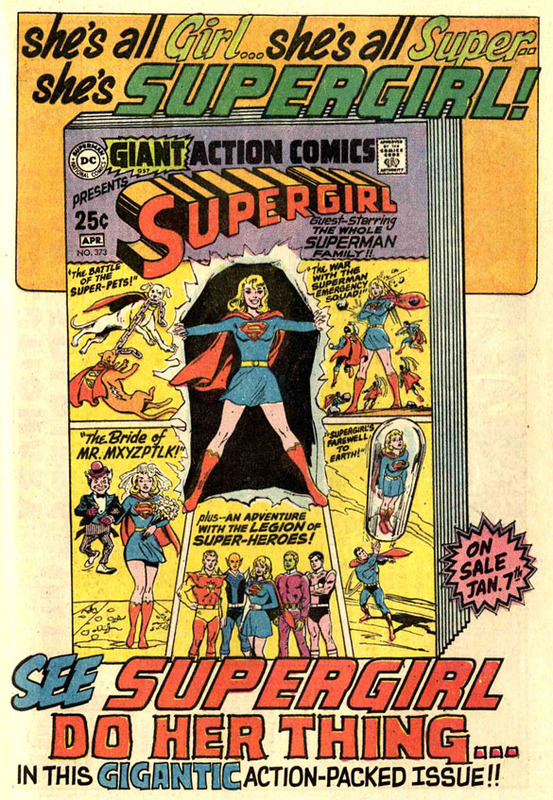 She first appears here in this British colour comic (which also features reprints of Fantastic Four #113 and Strange Tales #162). Hair color: blonde. She's an airplane pilot. 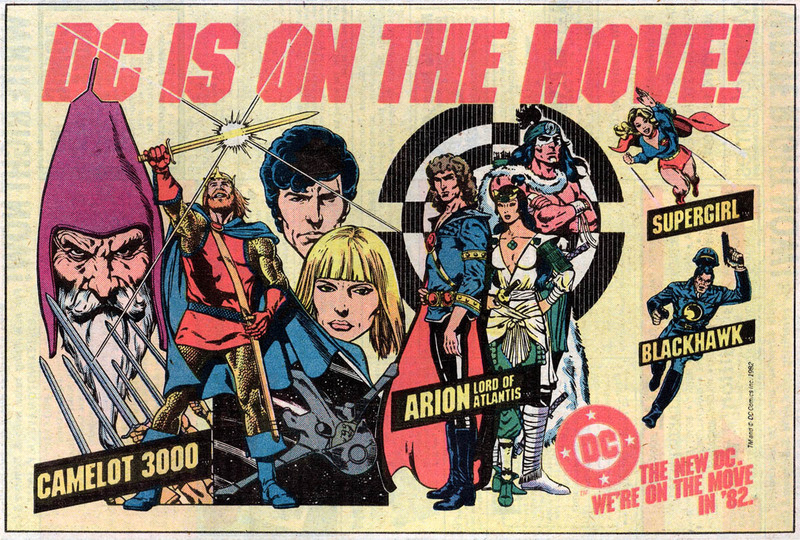 And if you've ever wondered why Chris Claremont has been so territorial about her...well, he's entitled. He and Herb Trimpe created her. *Seriously, such a great title. Nobody likes a practical joker. 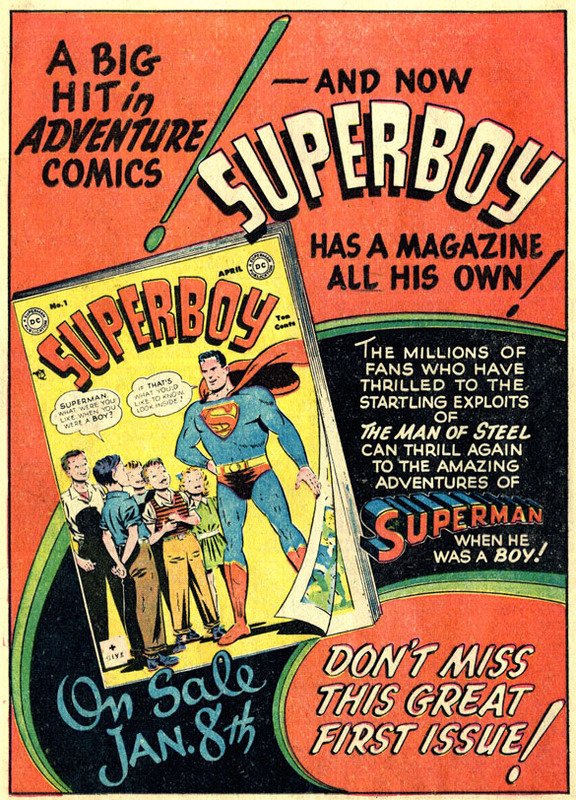 Especially one like Harold Dake, star of this cautionary tale from the Golden Age made to frighten the willied be-jibbers out of you, young impressionable post-War youth! 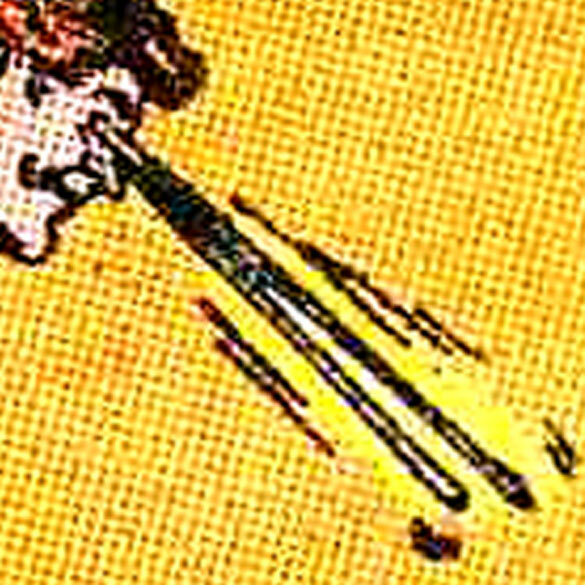 (Also: you'll shoot your darn eye out!) Harold Dake is an unrepentant jokester. Make no mistake about it: he will pull the snapping gum trick on you, or the squirting flower gag, or the face full of Joker gas old clichéd "fish in the hand" trick. 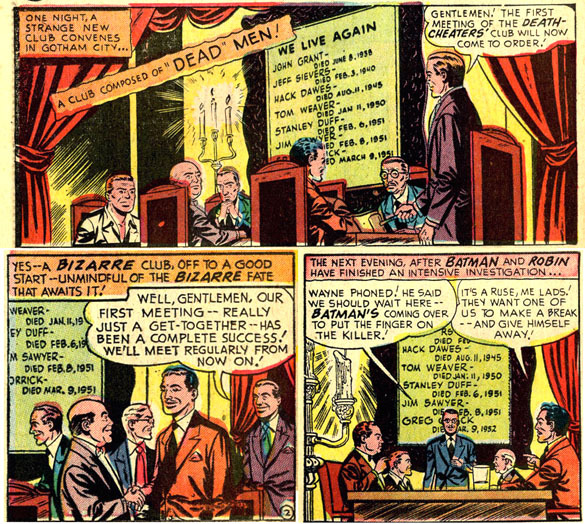 But when you pull a practical joke on the great Zatara, who, after all, makes a career out of tricking people...well, you're going to soon wish you were dead, Harold Dake! BWAH-HA-HA-HA-HA-HA! Because much like a circus elephant or the Psycho-Pirate, Zatara never forgets...to completely escalate his payback beyond all human reason. So, okay. 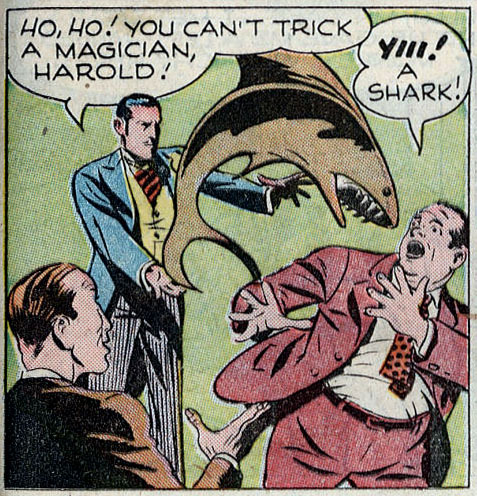 Looks like Harold had that one comin', and once they managed to get Harold's ear out of the shark's gullet, everybody had a good larf over the whole thing and Zatara gave them all tickets to his latest show at the Metropolis Metropolitan. The shark got to sit right next to Harold! However, if we know Zatara (and boy, do we know Zatara! ), that ain't gonna be the end of it. No no no no. 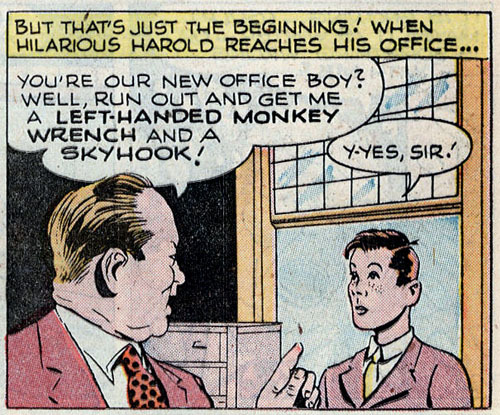 Now, I'm not excusing Harold's behavior, but hey, the left-handed monkey wrench is the oldest joke in the book. 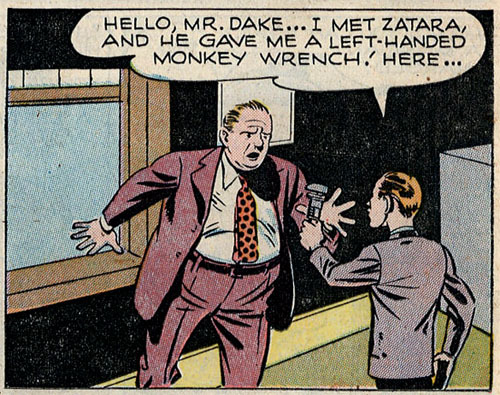 So that office boy shoulda known that monkey wrenches only come in right-handed models. The noive of him! 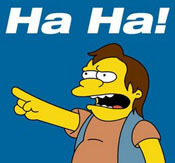 Still, it's all in good fun, even if everyone loathes the boss and spits in his coffee cup when he's out of his office. 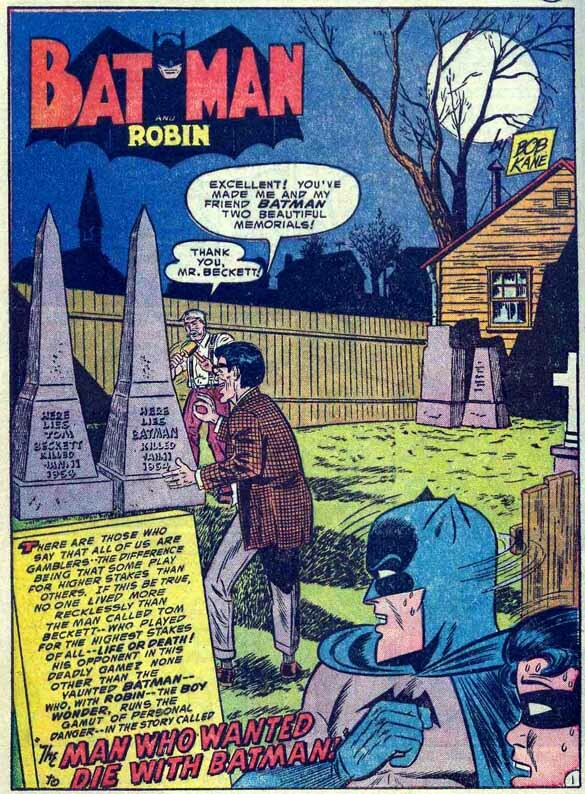 But, as I'm sure we're all asking, has Zatara finished being a jerk in this story? No. No, he has not. You'd think that Happy Harold would have learned his lesson by now, but nooooooo. 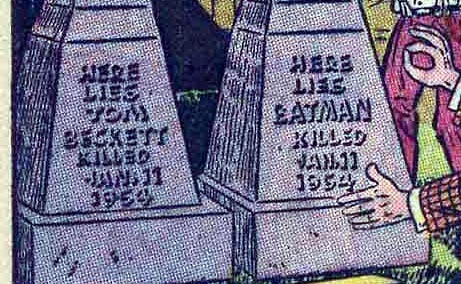 You do realize that the next practical joke you play will be met with Zatara killing you, right, Harold? It's raining men snow! Hallelujah! 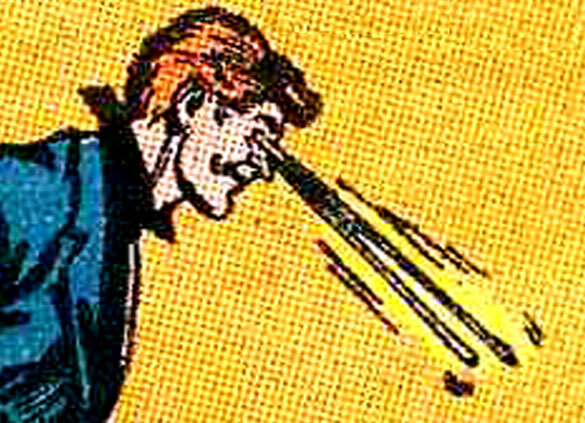 And I just bet that Zatara knew Harold left his Van Gogh out in the back yard to get some sun today! 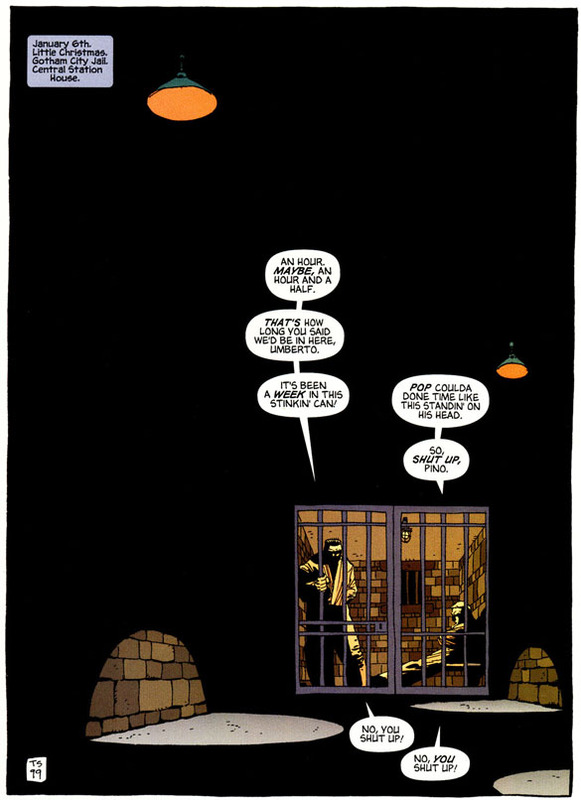 Then Zatara arrives with a giant noose so Harold can put himself out of his misery. Oh, no, wait...it's actually a giant skyhook. Say, what's that thing attached to? A giant turtle, maybe? But what's the turtle hanging from? Why, another, larger turtle. And what is that turtle hanging from? Awwww, you can't fool me. It's turtles all the way up. 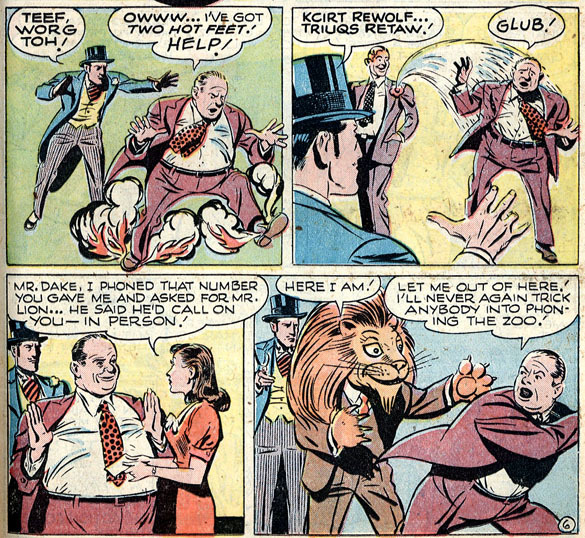 Then Zatara sets Harold on fire and drowns him. Then, as the night began to fall, a hungry lion paid a call. He looked Harold right in the eye, and asked him if he'd like to die. Harold said, "What is this thing? Some kind of album by Carole King?" So the lion ate Harold. What have we learned from this? 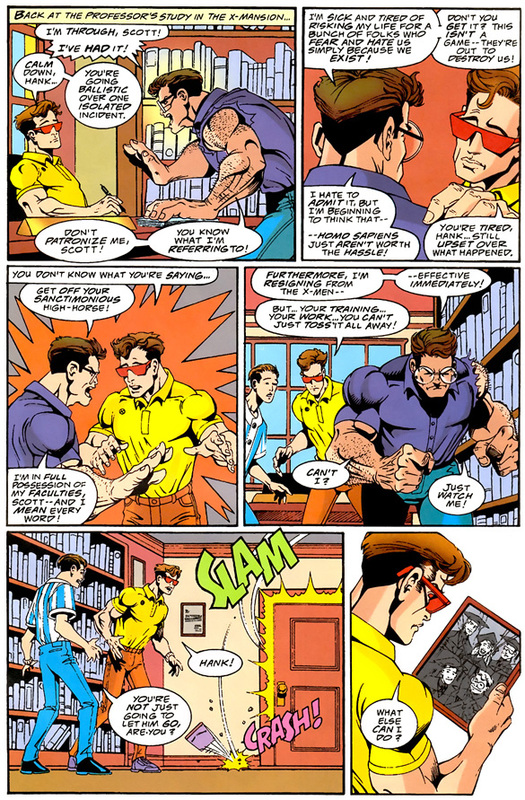 That Zatara doesn't like practical jokes and he can be a real jerk about them. We all know that when Zatanna was a teenager, she played a practical joke on her dad by swapping his coffee beans for Folger's Crystals. 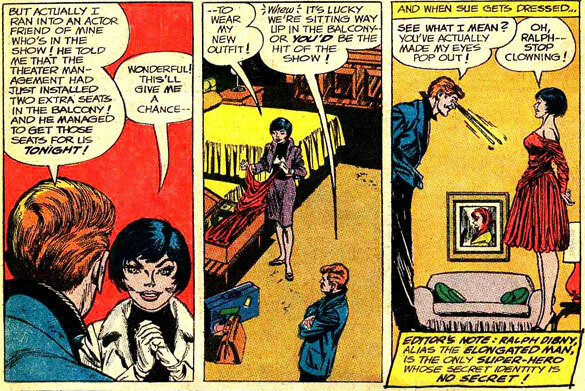 In revenge Zatara set Zatanna up on a blind date with John Constantine. Man, that's stone cold. And that's one to grow on! 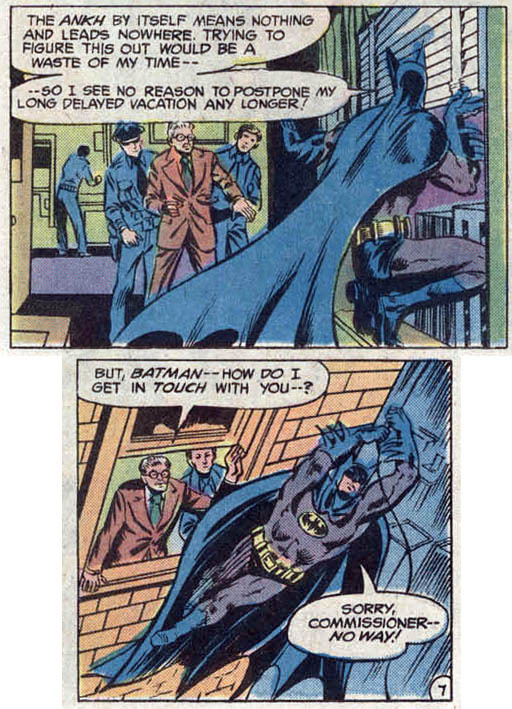 Don't you be like Batman and catch the cold and/or flu! Be sure to get your flu shot today! Unless you are the children of Jenny McCarthy, in which case, I just express my deepest, saddest regrets. 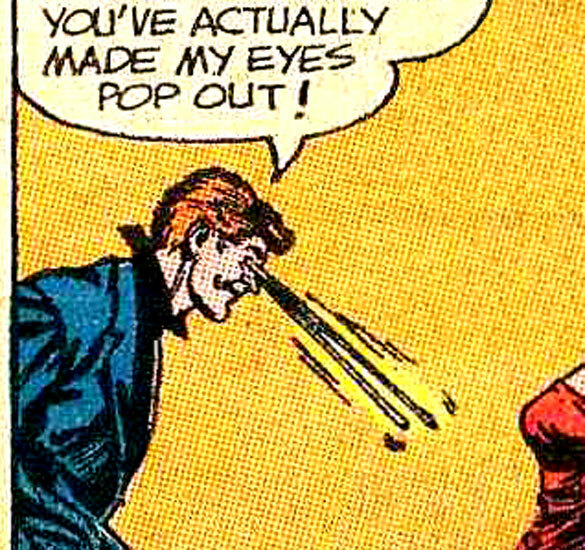 AW GEEZ, DON'T DO THAT, RALPH DIBNY! 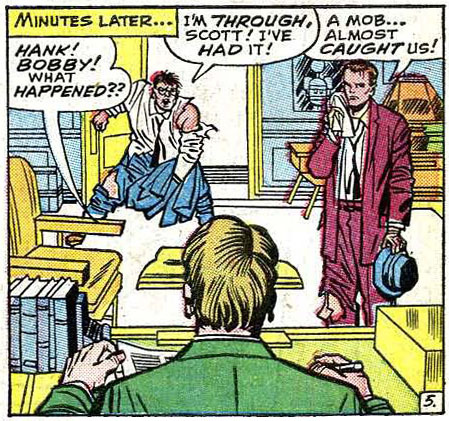 AW GEEZ, DON'T DO THAT RALPH DIBNY! GEEZ, DON'T DO THAT, RALPH! Hi, everybody! (There will now be a slight pause for you to say "Hi, Bully!") I'm back. 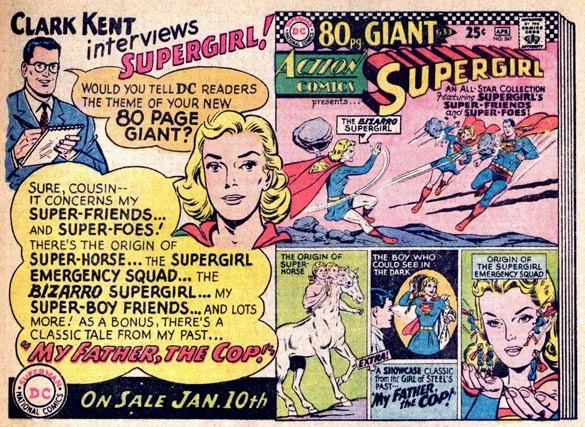 And I hope you had a very merry holiday season of your choice and that you got to read some fun comics over the seasonal break. 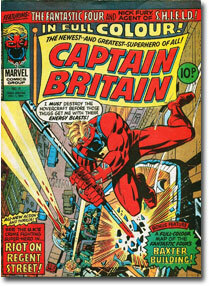 Me, I'm diggin' Marvel Now. 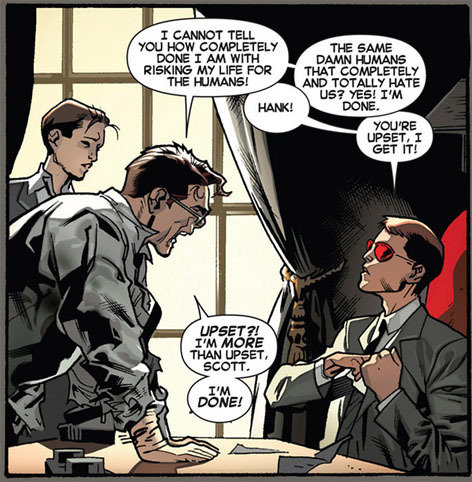 Well, I mean, I've always digged Marvel. I mean I dig Marvel Now. Now. 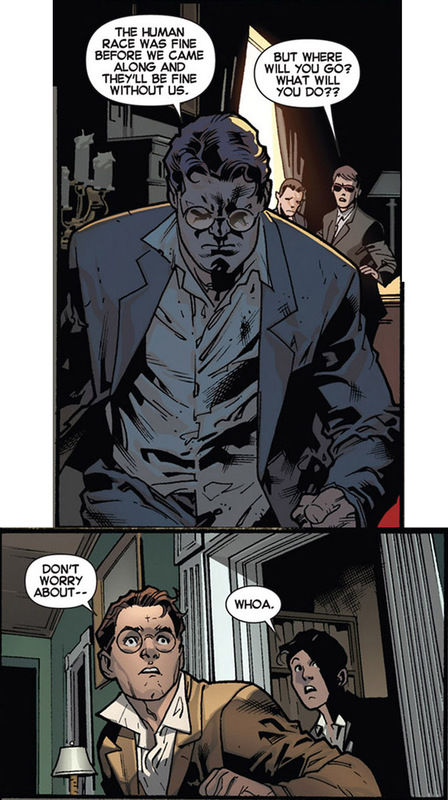 One of my surprise new favorites is Brian Michael Bendis's All-New X-Men. 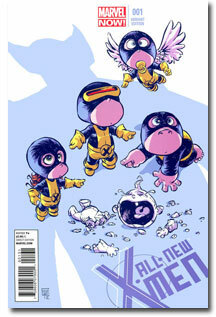 Favorite because I loves me the five original X-Men, surprise because I'm not a biiiiiiig little stuffed fan of Mister BMB's patented decompression. 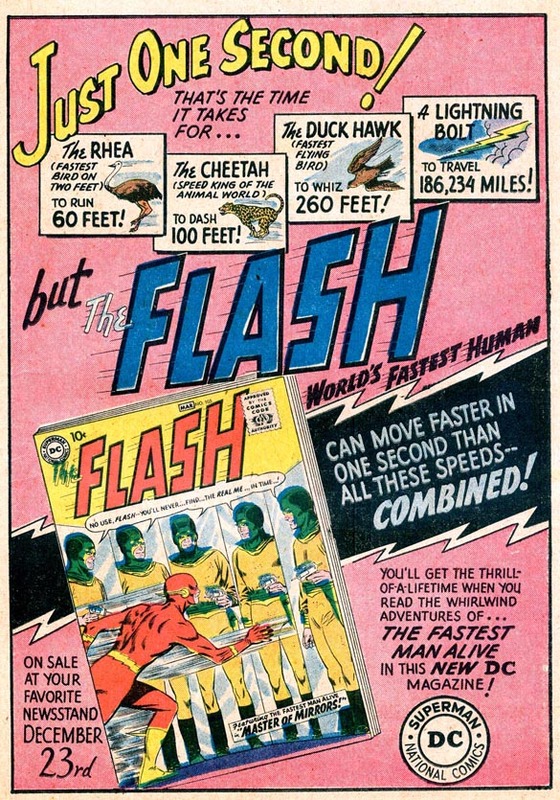 (Seriously, it takes four issues to get to that point? Ooooookay.) 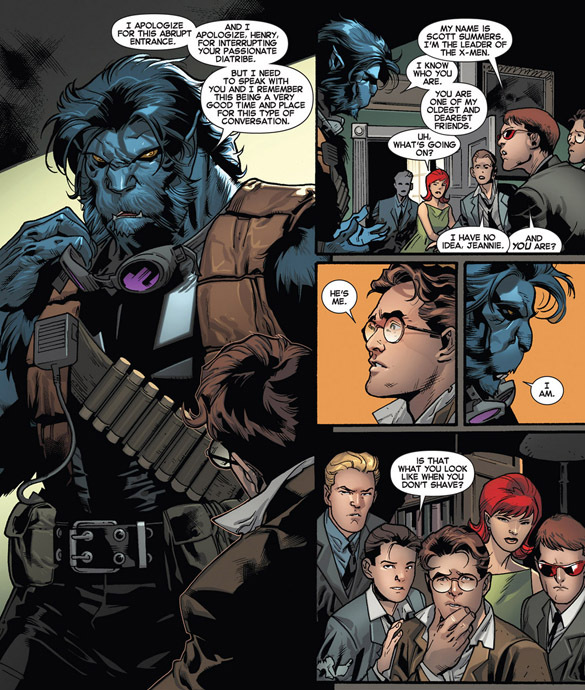 But I like the concept: Comics Oughta Be Fun-favorite The Beast brings the first X-Men (not to be confused with the Neal Adams miniseries The First X-Men) forward in time to meet the All-New X-Men (not to be confused with the All-New All-Different X-Men of X-Men #94). Although I think Thunderbird was involved with the decision of both. 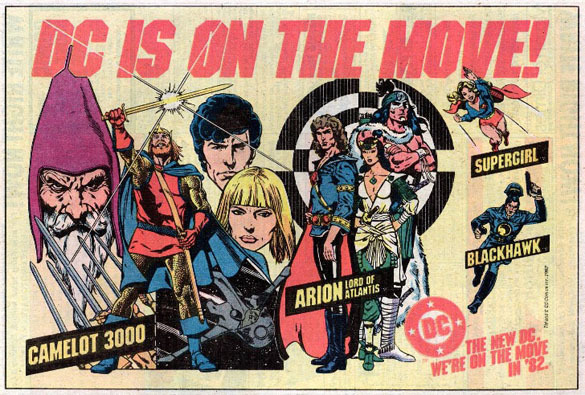 But hey, we're all wondering, just where did Future/Now Beast pluck Previous/Past Beast and company from? 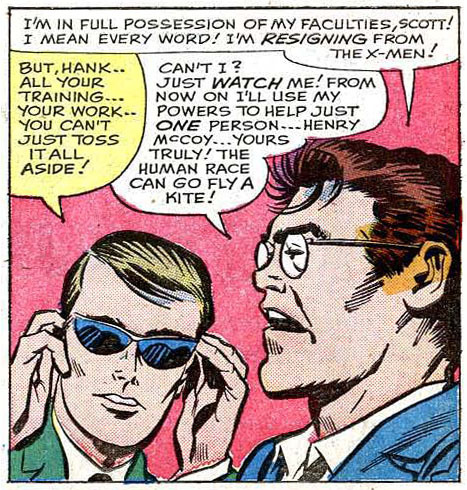 And after a trip down to the Bully Temperature-Regulated and Climate-Controlled Vault o' Comics to the "X" section, aisle 1, we can find that Henry McCoy-2013 picked up Henry McCoy-1964 from page six of X-Men #8. Very precise time travel there...hey when did the X-Men get a time machine? 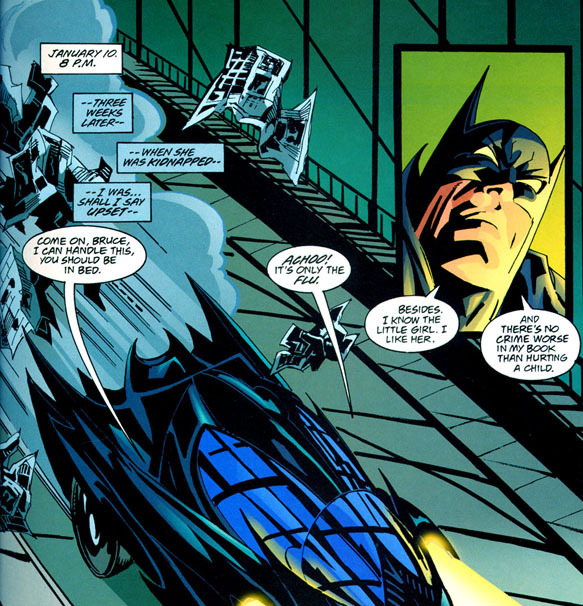 Whoops, Bendis-decompression™ kicks in (vrrrrroooooom!) 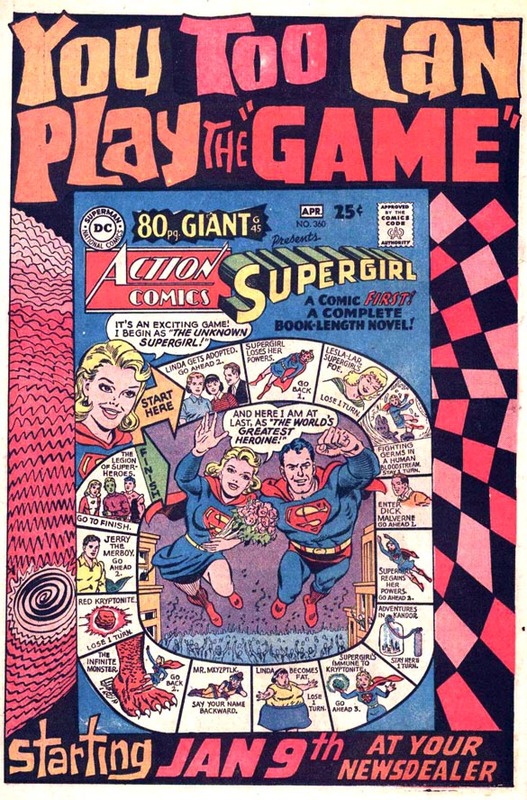 as Bendis finds a way to stretch a single Lee/Kirby panel into three. 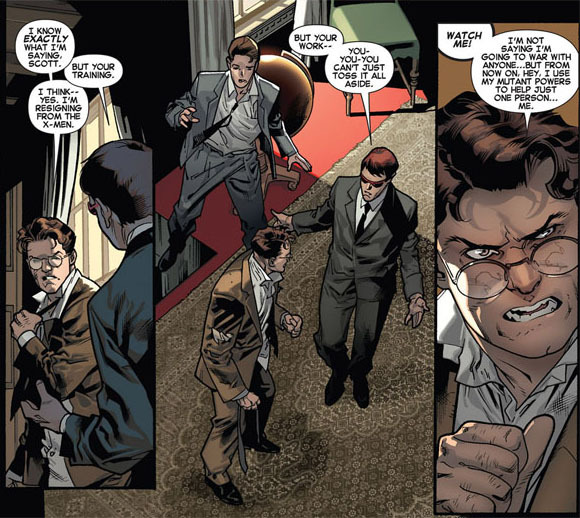 Well, it's not as drastic as expanding eleven pages from Amazing Fantasy #15 in six issues in Ultimate Spider-Man. I'd suggest that the juxtaposition of these two scenes is like the movie Rashomon, but you may have a different story. Timeline: successfully derailed! Now, as it has been rendered no-longer-happened through the wonders of time travel, please throw out your copies of X-Men #8. Do it! Do it now! 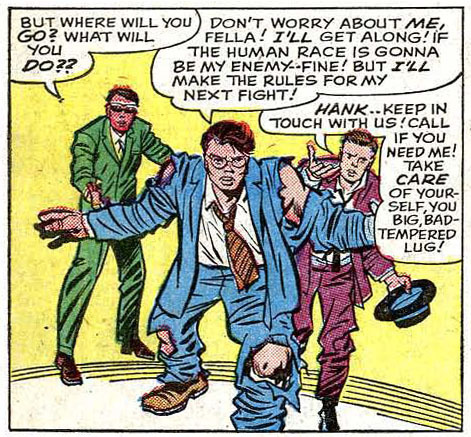 It's good to know that Hank McCoy will have a successful career away from the X-Men smuggling coconuts in his shoulder pads. What can we say...it was the nineties. 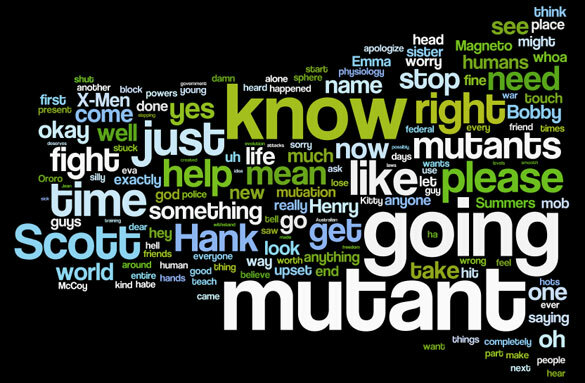 Hey, just for fun, here's the entire script to All-New X-Men #1...in convenient word cloud format. 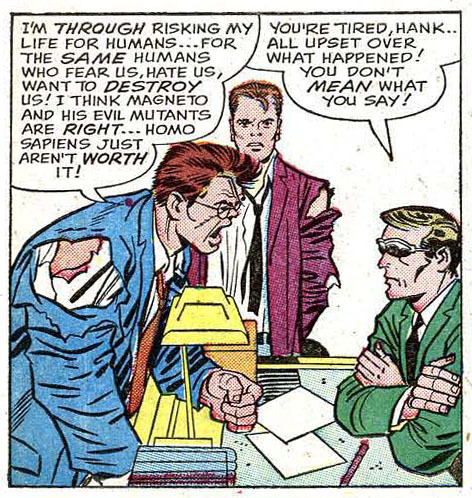 So, whatever else, we know what's happening in this story: mutants like going mutant. Also, humans need war. Same as it ever was. Play us off, all-new X-Men theme song! 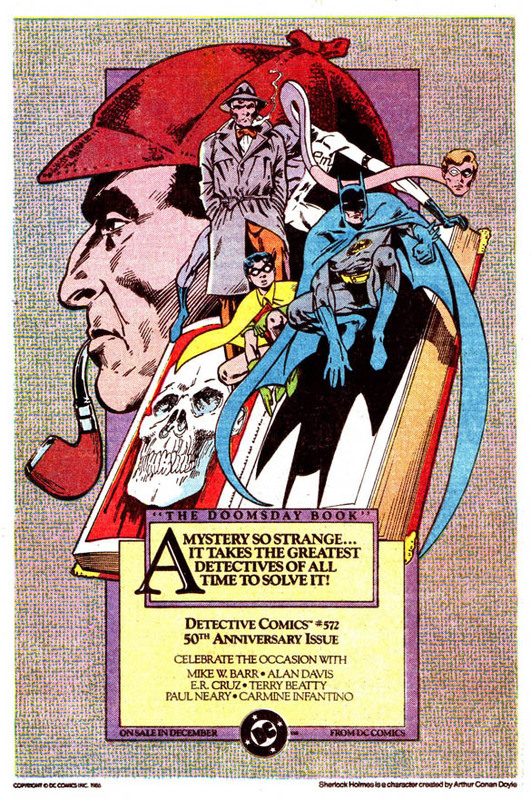 Happy 158th birthday, Sherlock Holmes!